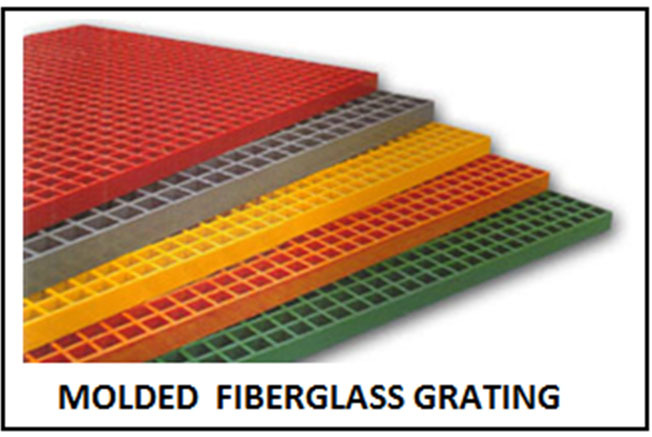 One of the most popular types of Fiberglass Grating we sell is Molded grating with a 1.5″ x 1.5″ Square mesh pattern. With 1/4″ inch bearing bars, the checkerboard 1-1/2″ square mesh pattern creates a 1-1/4″ inch square opening which equals approximately 70% open area. Molded Grating comes in sizes 1″, 1.5″ or 2″ Deep. The most common panel sizes are 3′ x 10, 4′ x 8′, 4′ x 12′ and 5′ x 10′. The larger the span between the supports under the grating, the farther the span, and the stronger and thicker the grating has to be. 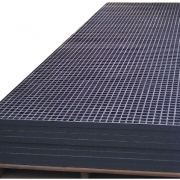 This molded fiberglass grating with square mesh pattern is one of many square mesh patterns in stock and available for quick delivery from National Grating. 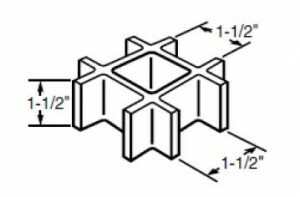 For 1″ inch molded grating, the maximum span is typically 24″. Anything farther apart than 2 feet, as you will need 1-1/2 thick or 2″ thick. Take a look at our Grating Selection Chart to see the various grating options depending on the span. We stock our molded grating in Dark Gray, Light Gray, Yellow, and Green. Call 1-877-984-7788 for up-to-date pricing and availability for the size and color you need. We have warehouse locations throughout USA and Canada, so we will always quote the closest location to you to minimize freight costs. If you need to cut the FRP grating sheets down to smaller sizes, you can easily cut the fiberglass panels using any saw that you would normally use to cut wood. You can use a skill saw, jig saw, table saw, or reciprocating saw. They key is to use a diamond tip blade. If you try to cut FRP with a regular blade, it will dull far too quickly. Check out our video on How to Cut FRP. Fiberglass grating will never rust, so it is great for corrosive environments such as as chemical plants, oil and gas, and waste-water treatment facilities. 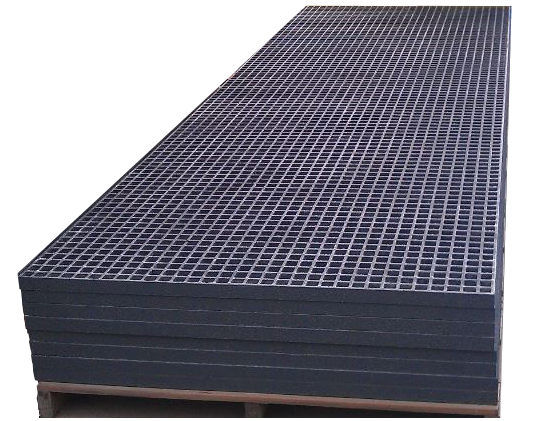 The gritted surface on molded grating provides excellent traction for slippery walkways. Fiberglass stairs and railing is used instead of steel in swimming pools and water-parks where Chlorine is constantly flowing on the the stairs and decks. We have pultruded fiberglass pool grating for these applications where bare feet walk on the grating, not work boots. 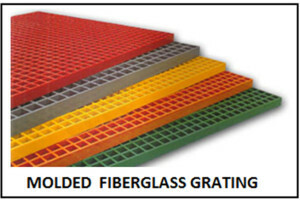 For all FRP Grating inquiries, please call 1-877-984-7788 or email sales@Nationalgrating.com or Request a Quote. 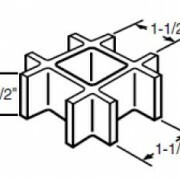 National Grating provides square mesh fiberglass grating to ALL USA States including California, Oregon, Florida, New York, Illinois, Pennsylvania, Ohio, Georgia, Michigan, Virginia, Massachusetts, Arizona, Washington, North Carolina, Nevada, Texas, New Mexico, Indiana, Tennessee, Colorado, Maryland, Missouri, Wisconsin and Utah. Our pricing and service experts are standing by to help to find the best product for your project. With many varieties in stock and expedited shipping, we can supply your project with square mesh fiberglass grating at the best price. In today’s connected world, we depend on cellular telephone signals, Wi-Fi networks and over the air radio and television signals. Wi-Fi and Bluetooth connectivity are essential to on-site work environments. Steel structures significantly disrupt these signals. Square Mesh Fiberglass is an essential part of FRP building structures that are “electronically transparent” and do not interfere with radio frequency transmissions.